You’d think that by now everyone must understand that fat doesn’t make you fat. Even the Harvard School of Public Health titles their page on fats with “It’s Time to End the Low-Fat Myth.” But apparently this is one piece of misinformation that just won’t die; it simply gets resurrected in a slightly different form and billed as something new. At this point, everyone understands that calories from fat aren’t different from any other calories. The fat that you eat doesn’t automatically get shuffled straight into the fat tissue in your body, any more than eating more protein will automatically build muscle. But the USDA dietary guidelines still try to cling to the low-fat line by weaseling it in sideways. It’s not that fat per se makes you fat; it’s that it makes it easy to eat too many calories, or that it’s just “empty calories,” or some other justification for why a low-fat diet is still superior. Both of these lines basically come down to “fat makes you fat” with some stage makeup on, and they’re both just as ridiculous. Essentially, they confuse fat itself with the junk food that it’s associated with, and blame fat when they should be blaming sugar, refined grains, and all the other disgusting chemicals that go into an Oreo or a Big Mac. In this version of the story, a calorie is a calorie whether it comes from fat or anything else. There’s nothing intrinsically fattening about fat itself, but fat is easier to overeat than carbohydrates or protein. So if you eat a low-fat diet, you’ll be restricting your calorie intake automatically, without having to count or track anything. 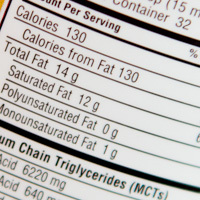 The evidence used to clinch this line is usually a simple piece of calorie math: fat has 9 calories per gram, while carbohydrates and protein have 4. So eating low-fat foods allows you to eat a bigger pile of food without gaining weight, which makes you feel fuller and less deprived, which lets you stick to a diet for longer. Sounds great, right? Not so fast. Yes, it’s true that fat has more calories per gram than protein or carbs. That’s a simple fact and nobody’s arguing it. But for most people (with the notable exception of the long-term obese), this simply means that fat is more satiating than protein or carbs: when they eat high-fat foods, their body tells them to stop sooner, and they don’t want as much. In this review (which concluded that “fat consumption … appears to have little if any effect on body fatness”), that effect is glossed over as “a compensatory mechanism,” but this report (free full-text) went into it a little more deeply: fat actually increases satiety, especially the medium-chain triglycerides found in butter and coconut oil. These fats activate appetite-suppressing hormones and slow stomach emptying (so you feel fuller longer). Essentially, human bodies have a very sophisticated internal “calorie counter” that naturally compensates for higher energy density (more calories per gram) with a faster feeling of fullness. We weren’t designed to need calorie counters to regulate our food intake; we have our own! It’s a very elegant system and as long as you stick to real, whole foods, it works beautifully. 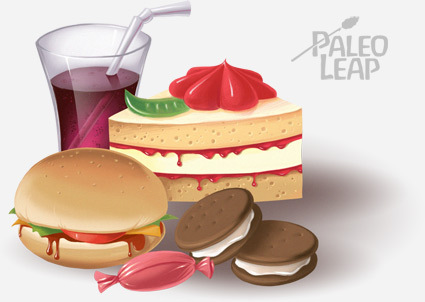 Unfortunately, when your fat intake comes from hyper-processed junk food, the system breaks down. Junk food is specifically designed to be addictive, so it overrides that natural feeling of fullness to make you keep eating. Now think about all the high-fat foods that are part of the standard American diet: chips, cookies, brownies, cake…if “high-fat foods” means “junk food,” then yes, increasing fat intake will make it easier to overeat. But if you’re talking about naturally-occurring fat from whole foods, there’s no evidence for this myth. This was the short version; for a great in-depth discussion, check out this series on hunger, satiety, and food reward. But the takeaway is clear: if you pay attention to your appetite and don’t overwhelm it with foods designed to be addictive, eating foods high in fat just makes you want to eat physically smaller portions of those foods, and total calorie intake does not automatically increase just because more of it comes from fat. Solid fats [namely, saturated fat] contribute an average of 19 percent of the total calories in American diets, but few essential nutrients and no dietary fiber. This is part of their case against saturated fat and cholesterol. But it’s total nonsense. First of all, fat is an essential nutrient. An “essential nutrient” is something necessary to life, and even the USDA admits that some amount of saturated fat is necessary to life. Saturated fat helps to form cell membranes all over your body, it’s necessary for good immune function, it’s a basic building block for hormones, and it provides energy (calories are a nutrient, too – they’re necessary to life just like magnesium or Vitamin C!). So claiming that solid fats contain “few essential nutrients” is silly. But what if they’re talking about vitamins and minerals? Those are what most people think of as “essential nutrients.” Surely, you could make the case that fat (which contains no vitamins and minerals) is lower in essential nutrients than foods that do. Liver and other organ meats. Fresh meat, especially ruminant meat. Dairy products (if you tolerate them well). If you’re consuming saturated fat from these foods, you aren’t getting “empty calories” by any means: on top of the saturated fat itself, they deliver all kinds of vitamins and minerals – often more than many “low-fat” foods. Which is more nutritious, a bowl of high-fat, high-cholesterol eggs, or a bowl of low-fat, cholesterol-free Rice Krispies? The low-fat myth is like a zombie: it just won’t die. Every time you think it’s finally gone, it just shows up again in another form, thinly disguised as a new position. But don’t let this confuse you: regardless of their fat content, junk food is still unhealthy and whole foods are still healthy. There’s no evidence that eating fat from non-junk-food sources causes weight gain of any kind, or that it’s “empty calories” that you’re better off without. In fact, some of the most nutritious foods around are high in fat (and especially saturated fat). They certainly won’t make you fat, and they might even help you lose weight (and feel better in the process).